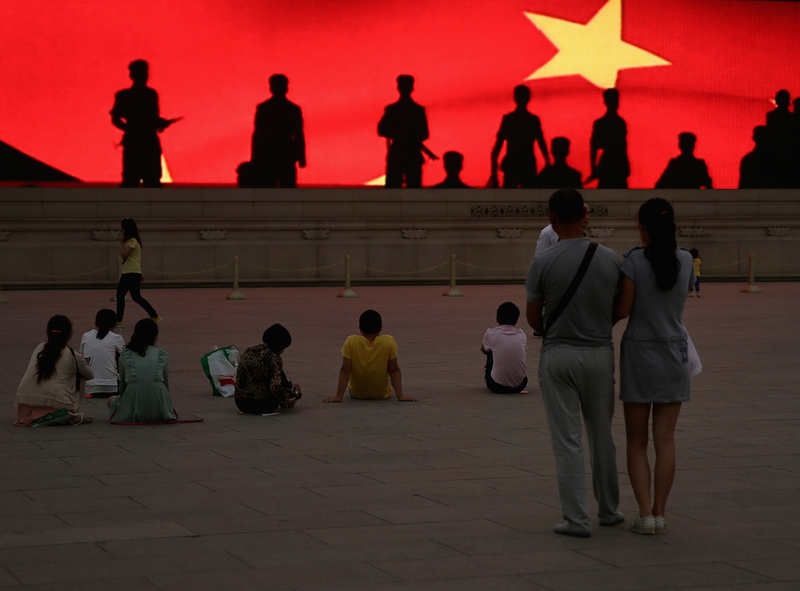 Tourists watch a LED screen showing soldiers’ shadows, before the flag-lowering ceremony at Tiananmen Square in Beijing, June 4, 2013. One of the simplest and least useful ways to understand the future is to take exactly what’s happening today and project it forward, rigidly and predictably, into tomorrow. This view is more than just a form of mental inertia; it is a breed of historical determinism, denying the forces of uncertainty and human agency that actually shape change over time. Yet this view appears to have taken hold, with stunning speed, in many assessments of the dramatic political events underway in China today. The latest example came in reaction to the deplorable decision to remove constitutional term limits on the presidency—an action that has underscored yet again the years-long process of Xi Jinping’s centralization of power and his willingness to break with the fragile norms of post-Mao Chinese politics. It is a decision of great importance, and it is an unmistakable indication of his intention to keep power. But to listen to some commentators, you’d think China’s political evolution is over, that it has now arrived at an endpoint of authoritarianism or Mao-style one-man rule. That’s the wrong conclusion to draw from Xi Jinping’s removal of term limits. This determinism is like a photonegative image of “the end of history” that liberal democracy was supposed to bring at the end of the Cold War—a misguided view that China has arrived at the political system where it will necessarily remain. Reflecting its Marxist-Leninist roots, the Chinese Communist Party (C.C.P.) system is designed to make decisions seem certain, final, and even inevitable. But when we analyze those decisions, we can’t simply accept that aura of certainty and inevitability and stop there. It gives Xi too much credit to see him and his decisions—as he may well see them himself—as some sort of inevitable manifestation of the dominant characteristics of Chinese politics, culture, or history. Instead, the reality is that this current retrenchment is a process in motion, just as reform in the direction of greater pluralism, transparency, or accountability is a process. The consolidation of one-man rule is a historic break with leadership norms and an implied criticism of the model that has prevailed since Deng Xiaoping. It is deeply regrettable. But it is not the end of China’s political changes. At some level, this may seem like an obvious point, and perhaps it ought to be. But in media commentary about China today, this determinism is widespread. It is similar to the view evidenced in much of the recent flurry of writing about the West “getting China wrong,” that China’s political system has “failed” to reform or liberalize. A reassessment of American China policy is overdue and highly useful, but not if it assumes that Xi-style authoritarianism is the endpoint of Chinese history in the 21st century. In a similar way, the future of the U.S.-China relationship is not foreordained; many outcomes other than great power war remain open and plausible. Policymakers in the U.S. have been discussing one kind of determinism in critiquing the erroneous view, held by some, that China’s economic reforms would inevitably produce political liberalization. Of course, many people advocated for an engaged China policy for far more nuanced reasons than the crude determinism of this form of modernization theory. But it’s important that policymakers do not replace a deterministic view that political liberalization was inevitable with the similarly misguided notion that the shape of Chinese politics today will last forever. China watchers should help the public understand that an effective response to the situation in China in 2018 can only come from understanding what we’re witnessing as part of a larger process. At every turn, China’s development has surprised outsiders, and many people within China as well. (In recent years, the same can be said of the United States.) The decisions of China’s leaders and the energies of the Chinese people have continually reshaped its economic, social, and political organization in a process of ferment and contestation that blasts apart the lazy fallacy of historical determinism in its domestic affairs. And individual and collective choices in the U.S.-China relationship still have ample opportunity to produce outcomes other than conflict. Even if the snapshot of the present feels totalizing or overwhelming, the logical consequence of accepting a deterministic view of China today would be to give up on even hoping for a more open China. That would be premature, as well as deeply unfair, to the many people in China who hope to move their society in a different direction. The C.C.P. may try to limit that human agency by crackdowns and restrictions, but can at most constrain rather than destroy it. As we assess China’s future and the future of U.S.-China relations, we must be careful to avoid falling into a habit of denying agency to anyone but Xi himself. Instead, we should fully recognize and even celebrate the human agency that will continue to exist throughout Chinese society, not just in one powerful leader.